Q. What can we learn from last week’s Knesset elections regarding the size and influence of the political right in Israel? A. The main lesson we must acknowledge is that the Israeli political right is bigger than even its new Knesset numbers suggest. Take, for example, the ultra-Orthodox parties, Shas and Yahadut HaTorah, which together account for 16 members of Knesset or roughly one-quarter of Netanyahu’s likely coalition of 65. Not only has their relative electoral weight grown due to their disproportionately high birthrate. They used to have a strictly religious legislative agenda that rendered them “religious” but not “right”, hence available to any coalition--left or right--that needed their votes and was prepared to make the necessary concessions. Now they are avowedly available only to a Netanyahu-led coalition: they made it abundantly clear during these elections that they are not only religious but also right-wing. Incidentally, if we go back a few decades we can find not only the ultra-Orthodox but also the Orthodox National Religious Party espousing dovish views in Labor-led governments. That party has now morphed into the Union of Right-Wing Parties with its fascist and Kahanist components. Beyond the Haredim or ultra-Orthodox, we must account for an additional portion of the electorate in these elections that is the equivalent of roughly ten mandates and is right-wing. Three right-wing parties that failed to pass the four mandate threshold (3.25 percent of the vote)--Naftali Bennet’s Jewish Home, Moshe Feiglin’s Zehut and Orly Levy-Abakasis’s Gesher--together drew votes that are the equivalent of six or seven lost mandates. Note that on the political left nothing similar happened: Meretz and both Arab parties all exceeded the threshold and entered the Knesset, meaning no left-leaning votes were wasted. Then there are the committed right-wingers, led by Moshe Yaalon, who joined the centrist Blue-White list because they are viscerally opposed to Netanyahu. They will now almost certainly end up in the political opposition, but their sentiments are generally pro-settler and pro-annexation. All told, we reach the equivalent of more than 75 out of 120 Knesset mandates, a few lost to the voter threshold law, representing at least 62 percent of the Israeli electorate who must be considered right-wing to one degree or another. Indeed, in these elections the drift among these 62 percent was toward more extreme right-wing views: note how Moshe Kachlon’s relatively moderate Kulanu party shrunk from ten mandates to a mere four. For many of these voters, egged on by Netanyahu’s electoral rhetoric, “left” and “liberal” are now dirty words. Q. On Monday, President Rivlin begins consultations with elected party leaders that appear certain to crown Benjamin Netanyahu prime minister yet again. What is Netanyahu’s next coalition likely to do to the country? A. It is liable to impose more Orthodox Jewish religious influence in education, culture, the economy (Shabbat closures), the army and other national institutions. There will be greater delegitimization of the left, Arab citizens, civil society institutions and rule-of-law institutions like the courts. Immunity from prosecution for Netanyahu will be pushed at an early juncture. We will see more and more West Bank settlements and displacement of East Jerusalem Palestinians in favor of Jews. There could be a move toward annexing up to 60 percent of the West Bank (“Area C”), depending on the degree of encouragement provided by US President Trump’s “deal of the century” peace plan (see below). Sadly, I wouldn’t be surprised if this coalition tries to outlaw or at least in some way legally marginalize key human-rights and peace-oriented organizations like Shalom Achshav (Peace Now). Q. How did Israel get to this degree of ultra-nationalist right-wing and religious influence? A. This is a long story--one of book length. In short, in many ways this is the Israeli public’s reaction to extended occupation and to the repeated failure of attempts at a peace process with the Palestinians (for which all Israeli governments but also all Palestinian leaders and their Arab backers are to blame). It is a reaction to Palestinian terrorism and particularly suicide bombings, and to a failure of leadership on the political left. Lest we forget, prior to Netanyahu’s reign of the past ten years the right failed as often and as badly as the left by losing elections to the likes of Rabin, Barak, Sharon and Olmert. Then too, the Likud-led right has known in the past how to be pragmatic: recall Begin’s peace with Egypt, Shamir’s resolve not to retaliate against Iraq’s Scud missile attacks during the First Gulf War, even Netanyahu’s studious avoidance of all-out war in Gaza and with Iran in Syria. But the right has also consistently offered an ideological alternative. It is particularly attractive these days when so much of the world is moving right: Trump, Putin, Modi, Bolsonaro--the list is long and growing. Trump in particular is an ideological model for many Israelis, and Putin for a million Israeli Russian-speakers. The ideological right was always there, going back to Jabotinsky and the early years of Zionism. In this connection, I recall overhearing a remark in the mid-‘90s by Moshe Arens, a Likud leader but an opposition member of Knesset under a Rabin-led peace-oriented government. “Bunch of lefties” Arens said (in English) about me and several others at a moment when he thought he was out of our hearing-range. I forget the specific political context. What I, almost certainly alone out of us “lefties”, registered was the McCarthyist echo in the remark. Arens, we recall, spent his formative years in the US during the McCarthy era and was active there in right-wing American Zionism. Q. President Trump stated last Wednesday that his peace plan now “has a better chance” thanks to a Netanyahu-led government. Can you explain this? A. Only if the intention of Trump and his team, led by son-in-law Jared Kushner, is to somehow put together a coalition matching up Netanyahu with wealthy Gulf states led by the Saudis to invoke a combination of heavy political and even military pressure on the Palestinians, mixed with huge financial incentives for them. The idea is that the weak but greedy Palestinians respond by capitulating in a territorial deal that heavily favors Israel and by conceding their refugee/right of return demands. This will fail, due not only to the wholesale opposition of the Palestinian leadership and violent opposition of Palestinian militants. It will also encounter the objections of Netanyahu’s more extreme coalition partners, who will not countenance anything short of total annexation of the West Bank and expulsion or disenfranchisement of the area’s three million Palestinians. Q. Are you sure that is the Trump-Kushner plan? And are you sure Netanyahu will be inclined to support it? A. No, on both counts. We have no authorized version of the Trump-Kushner plan. This is all speculation. 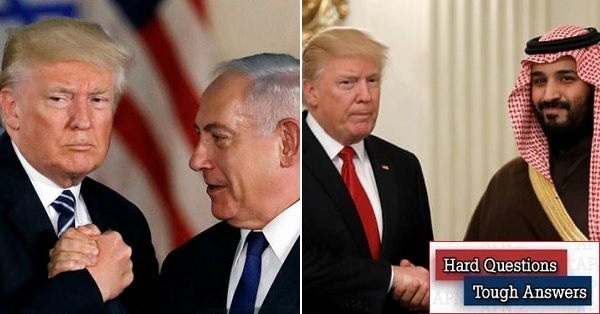 The Lebanese leftist daily al-Akhbar, for example, describes the version of the Trump plan it claims to have obtained as involving Jordanian readiness to absorb a million Palestinians, enter a confederation with Israel, and swap territories with Israel and Saudi Arabia, all in return for $45 billion. Lebanon, according to this plan, will absorb all its Palestinian refugees and Egypt will turn over part of the Sinai Peninsula for absorption of Gaza refugees--both, presumably, in return for huge sums of Saudi money. All of these ideas have been roundly discredited and turned down by the Arabs for decades. Al-Akhbar is presumably whipping up a-priori Arab opposition by inventing fake news. Even Washington Institute Director Robert Satloff, not known as a supporter of the two-state solutions advocated by the Israeli political left, warns in Foreign Policy that if the “Kushner plan” (as understood by him) is implemented, “it stands a good chance of setting back US interests in three critical areas: it might lead to annexation of the West Bank, it could give the Saudi government leverage over the United States that it doesn’t currently have, and it would distract from Trump’s signature achievement of putting real pressure on Iran’s government”. Satloff presumably knows better than al-Akhbar what Kushner will soon offer Israelis and Arabs. Satloff also presumably fears the demographic-political and regional consequences for Israel of wholesale West Bank annexation. But Netanyahu’s more moderate supporters ignore at their peril the fact that, unlike in the past, Netanyahu appears to feel emboldened by the ignorant recklessness of an American president. Q. Are the Kahanist-fascist extremists the only potential fly in the ointment of Netanyahu’s next coalition? A. No. Nearly two-thirds of the Israeli electorate may lean to the political right, but they are not all in the anticipated coalition. Lest we forget, these elections demonstrated just how fragmented and fractious the Israeli right is. 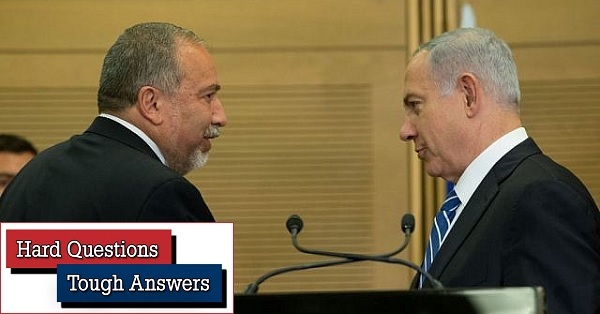 The lynchpin of Netanyahu’s next coalition is Avigdor Lieberman with his five Yisrael Beteinu mandates. Without them, Netanyahu can muster no more than 60 votes--not a Knesset majority. Lieberman, who is playing it very coy, could conceivably demand again to be defense minister--a post he resigned last year over Gaza policy where he insists on a more aggressive approach than the cautious Netanyahu. If not offered enough in Netanyahu’s right-religious coalition, the very secular Lieberman could also conceivably agree to join only a government of national unity that brings the Likud and Blue White together without the religious parties. That’s a longshot. Netanyahu of course might use the threat of a unity government with Gantz as leverage to keep his right-religious coalition partners in line. But at least for the moment Gantz is pledged to turn him down. All this points to the hard horse-trading that awaits Netanyahu with his Haredi, Kahanist and other extreme right-wing partners and even hardline Likud members of Knesset. He’ll succeed--he’s a very smart politician, though the task could take many weeks. Ultimately, and barring the unforeseen, the events most likely to slow his next coalition’s progress in implementing its repugnant platform are indictments and war or severe unrest generated by the ignorant and bumbling Trump-Kushner concoction labeled the “deal of the century”.